Last week I mentioned that I was going to take a break from hunting for a week and take my daughter fishing. Last Thursday was a beautiful day, so after work I picked up my oldest daughter, Lila, and took her to some small freshwater lakes about 20 minutes from my house. Our target: Bluegill. The ride itself would have been exciting enough for Lila. She loves riding in the front next to me in my truck, especially with the windows down. Lila is two and a half, although she tells everyone that she is three. Three is her favorite number. Everything is three. She is recently potty trained and this made me a little nervous about taking her out to the lakes. 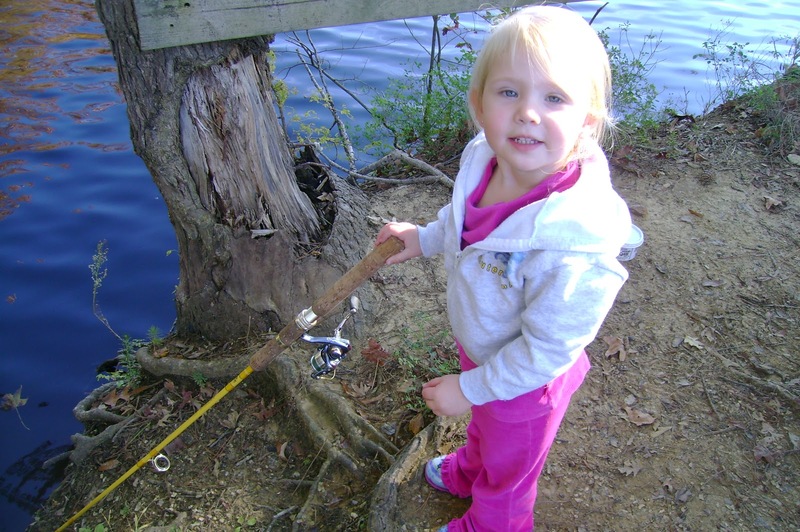 She has never been fishing, but knows all about it from watching Dora. I haven't been to the lakes in over a year and they had made some changes. Some nice new piers were scattered around and there was a new bridge to my favorite spot. I remembered a spot that never failed to produce bluegill, so we stopped and unloaded our gear. 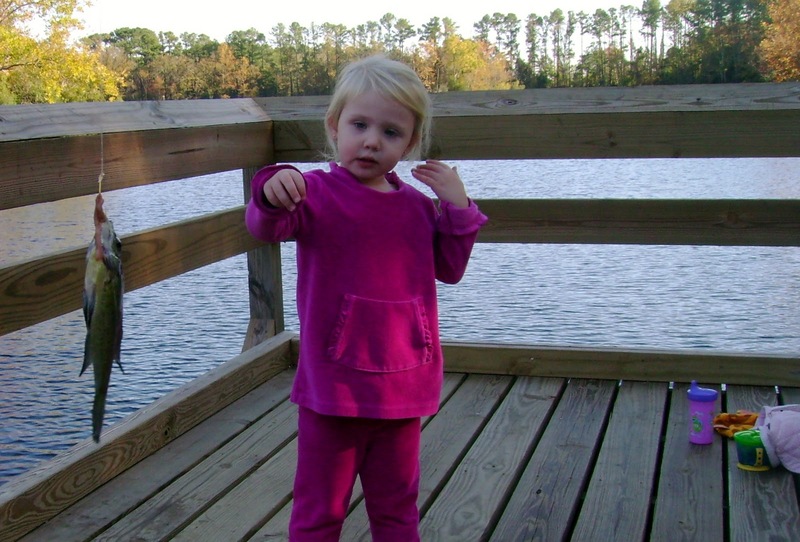 Lila was very excited that we were going to catch a fish. Like a typical girl, she thought the worms were "ewww yuck!" I baited her hook and cast it out. To my amazement I did not have to show her how to real it in. "Just like Dora!" she said. I need to buy her a pole her size. My 7 1/2' ultralight rig was just to big for her. By about six feet! 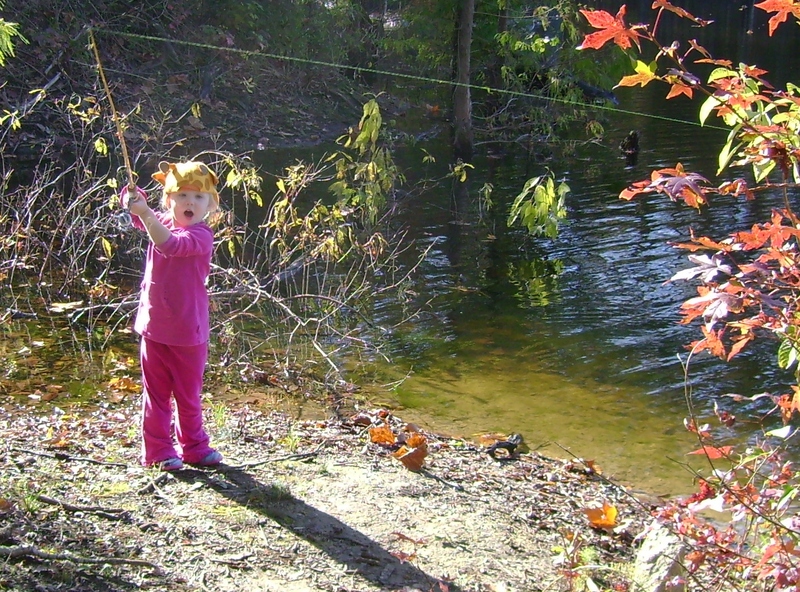 She had no interest in watching the bobber, but she really enjoyed reeling it in. Lila was not strong enough to hold the rod tip up, so she put the tip in the water. It worked well enough. My secret spot was not productive. A year and a hurricane can change things. We packed up to try another spot. The only problem we encountered was that there was a lot of mud. Lila thought it was poop and didn't want to step in it. After a little coaxing she forgot about it. Notice the stylish giraffe hat. On to the next spot. I chose a pier, knowing that little bluegill like to congregate under piers. Lila liked that she was walking over the water. It was snack time so I gave her some homemade pumpkin chocolate cookies my wife made and a sippy cup of apple juice. I asked if she needed to go potty and she dismissed me with a simple "nope". This was way to exciting for a potty break. As she was enjoying her snack I dropped a worm and bobber over the side. Almost instantly I got a bite and before she could stuff the rest of the cookie in her mouth we had a fish on! I handed her the pole and helped her reel it in. 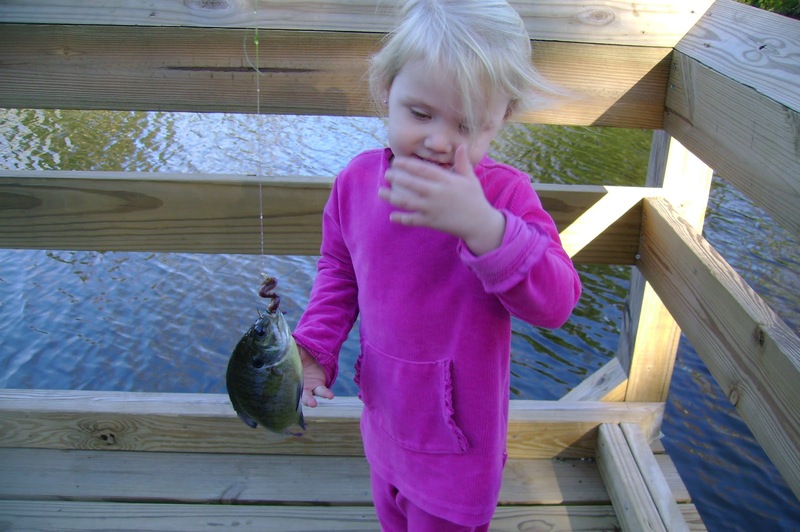 Her first fish! A wonderful 5 inch bluegill! Shortly after that we caught another. Lila was very excited when we caught them, but had no interest in touching them. Typical girl. She really enjoyed letting them go and seeing them swim away. Time was running short. I wanted to get back in time for dinner and we were approaching three hours without a potty break. I was nervous. I threw out the line one last time way out there to let Lila reel it back in. As she was reeling a nice bluegill took the worm and hooked itself. I just let Lila keep reeling and before she knew it she had caught a fish all by herself. This was exciting for both of us. Lots of yelling and dancing ensued. Three fish! It was a wonderful trip. I can't wait to take her out again. I have plans to make my boat more toddler friendly so this summer we can have lots of fun! Oh yea, she made it back home without having an accident. Three and a half hours, not bad for only starting potty training two weeks ago.